People find it hard to picture a bride with short hair. It is somehow reckoned unconventional and unattractive for a bride to appear that way, which is not true. In my opinion, if you style it well, short hair can look as elegant as long hairstyles. Brides, in general, are always in a hassle to find the best hairstyle for their most special day, the wedding. Many think that if the bride bears a short haircut, then her troubles only double. 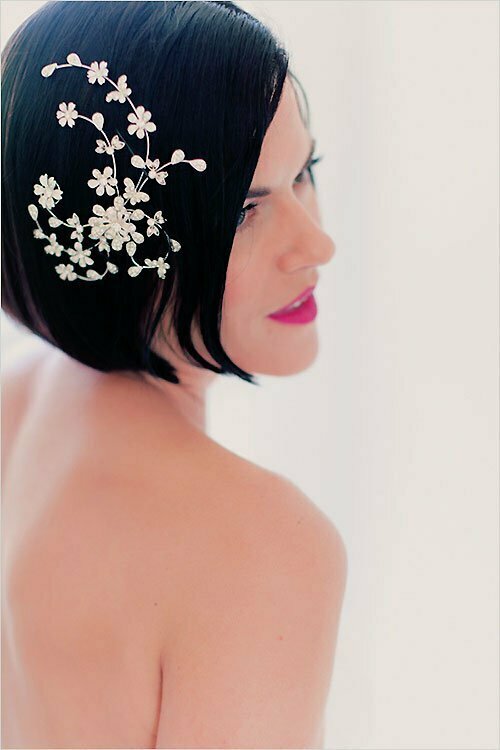 Well, such brides can always refer to this article about the wedding hairstyles for short hair. Hairstyles that are mentioned here can also be worn on other special occasions like a prom night or a formal party. Since wedding hairstyles need to complement overall bridal makeup, you need to be careful while shortlisting the perfect bridal hairstyle for yourself. You also need to consider the wedding theme and act accordingly. For instance, you cannot opt for a punk hairstyle with glittering hair color for a traditional church wedding. Well, let's take a look at some easy cute short hairstyles that can make you look gorgeous and unique on your wedding day. Fanned faux updo hairstyles are excellent for brides with short to medium length hair. This is one of the most voguish wedding hairstyles for short length hair, which is done by flipping the head down and braiding the hair in an upward direction - from the neck to the back of the crown. The end of the braid is then secured at the top of the head with help of some discrete clips, in a way that the hair gets a fanned out look. The messy direction which is given to the hair actually creates a wild and edgy looking hairstyle, which is quite attractive. Brides with bob hairstyles or other similar haircuts can surely opt for this hairstyle. This hairstyle incorporates smooth waves and offer you a look of some movie star from the 40s. To create retro waves, you need to part the hair in large sections by either wrapping them around large rollers or by using a wide hot brush. This can be one of the best and easy wedding hairstyles for short curly hair. You can cascade the face with a few natural curls, by using a wide hair pick. You can also accessorize this hairstyle with some subtle hair accessories like a small studded hair pin. You can also use hair spray to add extra radiance and control to the waves. It is important to perform this hairstyle on clean and washed hair, since smoothness is the key to make it work. Curls do add an ideal look for brides with short hair. You just need to decide what kind of curls you want. If you bear 2 to 3 inch long hair, then you can opt for tight curls that look wrapped around the scalp. If you bear a bit longer hair, then you can also clip up the hair at the side, on top of the head, and pull down a few face framing fringes for an elegant look. You can also turn these fringes into pincurls. This is an excellent hairstyle for brides with thin hair. You can also combine a layered haircut with curls to make it look even more attractive. On the other hand, you can also consider layered haircuts as the perfect option when it comes to the wedding hairstyles for short hair. They can actually give extra lift to short hair and accentuate the look of the tiara and the veil. You can opt for various kinds of layers like tapered layers, razor edge layers, choppy layers and layered hairstyles with bangs. Women who are looking for wedding hairstyles for very short hair can opt for wigs and hair extensions that gel along with the occasion. If they want to maintain the same length, then they can also opt for some very short hairstyles like the gamine crop haircut, fashion haircut, very short haircut with layers, very short side swept bangs combined with gamine crop haircut, etc. You need to be careful while choosing correct hair accessories for the occasion. Short hair needs to be accessorized with minimum effort and hair accessories. For instance, a small fresh flower or a studded hair pin is the best choice. Well, these were a few ideas for wedding hairstyles for short hair. Hope the article was found knowledgeable!